Last summer the Squat Orfanotrofio in Thessaloniki was evicted and demolished by the Greek government. One commerade faces repressions now for the squating alone, standing at court for all of us, on the trial on the 31.05.2017. We call for solidarity. The story begins with the squatting of the Orfanotrofeio in December 2015. Thousands of migrants have been declared illegal overnight and are stuck on Greek territory. Within a months they were also displaced from Idomeni, an massive self-made and to a great extent self-managed settlement near the border with the Rep of Macedonia. They were moved to isolated camps throughout the country, under the surveillance of the army and the NGOs. Those of us who had been visiting Idomeni frequently during the summer of 2015 had seen a wall being built in front of our eyes, people practically living in the mud, being beaten up by the police, giving birth in offhand tents, burning anything they could find from the ruble for some heat in the freezing cold, being moved around from town to town and from camp to camp, in buses that would just show up and then disappear, being constantly stopped for pointless checks in the middle of nowhere on their way to the border. If when they made it to the border, they were often pushed back to Athens, where many of them fell into the hands of smugglers and even organ harvesting mafias. The list gets longer as the plight continues. Migrants are becoming invisible again, while Greece is being transformed from a mere smuggler-State to an NGO/humanitarian fund collector. At the moment, refugees are concentrated in detention camps, prisons and police departments, where they are being murdered, psychologically crushed, and inevitably pushed towards self-abandon or structural illegality, since they have no opportunity to settle, to work, to get some education, to claim their dignity. Within this situation many people chose to act and stand by the migrants. Not our of pity, not for money, just like that. That is who we are. We came together from various parts of the city and of the world, from the social movement of struggles in the workplace, in our neighborhoods, at school and college, on the streets. We had the common need to create a place where locals and migrants could gather and meet, a collective space away from the surveillance and control of NGOs, of the State and its institutions, a space that would encourage equality and self-organization. This space was the abandoned former Orphanage (that had been occupied by the movement before). It was occupied so that it could provide shelter to migrants, people who are being repressed and marginalized simply because they were unlucky enough to be born on the wrong side of the earth, on the wrong side of a hierarchical bipolar value system for which some human lives are superior to others. They were unlucky enough to exist in a world that imposes and reproduces the repressive notion that divides people into privileged and disenfranchised. We became an assembly, of privileged locals and europeans as well as migrants, with many different translations and even more languages among us, for a common struggle, not a struggle of representatives. We squatted the former orphanage ‘Megas Alexandros’ and with our own hands we, (the migrants, the locals, the europeans) created bedrooms for up to 80 people, a kitchen, a pharmacy, a children’s space, a café, a garden. We held regular meetings with lawyers who took care of migrants’ papers, and regularly received food and clothes offered by neighbors (who often participated in the life of the house too). We organized talks and discussions within the house but also at open squares, squats and festivals about the Orfanotrofeio project, as well as about the rights of migrants to free mobility and papers. We organized actions against the evacuation and the demolition of the building, called meetings in front of migrant detention camps demanding their release, demanded free access to work and health services, several groups continued their regular visits to the camps and actively participated at antifascist initiatives. All decisions were made at the weekly assemblies that were translated in languages that covered all participants. We did not discriminate according to religion, country of origin or family status. Most importantly, we did not and never will accept the distinction between legal and illegal migrants. 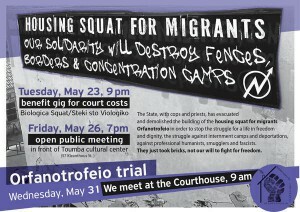 For us, this squat became our vital space and the first safe place for migrants. It lasted for eight months and it was proof that we can live, work and struggle together. At the end of July, the police knocked on our door with cranes and bulldozers, arrested whoever they found inside and finally left the contractors finish off the holy business of the church and pulled down the entire building. It is amazing how well the town council, the SyrizANEL government, the police, the university, the mass media and the church can collaborate when it comes to the management and repression of migrans. We had been threatened from the very beginning by the «charitable» priest mafia. There are reasons. Because the majority of migrants are muslim. Because these migrants were visible, they participated in the everyday life of a lively area, instead of being socially excluded, out of sight, as the State would want them. Because the church wanted the estate without the building for a charitably profitable mega-project of its own. After years of indifference, the church finally decided to demolish not only a historically significant building but most importantly a project of solidarity, that had managed to live up to the needs of society, against the logic of capital. It demolished a building that had become our home. A lot went down with it: A place for meeting, a place filled with stories and experiences, whole storage rooms with clothes and food, personal belongings. But we will not give up. Some of us continued our journey, some have stayed here looking for a job or preparing their next move. For us, giving up would be denying the urge for freedom. Until today, the estate of the former squatted home at the Orfanotrofeio is full of rubble. There has been no «effective use» or «transformation» the church and authorities were talking about. This proves what we knew already. The evacuation and the speed with which the demolition took place had nothing to do with the need to create an «institution for the common good» and everything to do with wanting to destroy a dangerous project, a community of struggle where locals and migrants lived and acted together. The situation for migrants has not changed much. People have become accustomed to hearing about the drownings in the Aegean. The majority of refugee children did not start attending school. The camps are being “upgraded” so that they can receive more refugees, away from the city centres, isolated and marginalized. Deportations to the “safe country” of Turkey are going on, following the Greece-Turkey deal. After the evacuation of the Orfanotrofeio squat we were lead to camps outside the city. We chose to return to the city and unite with other people in the struggle against repression, yet the State is determined to isolate and divide us. People in solidarity in court are facing serious sentences and huge fines. Our unity however is getting stronger, and we will always be together in solidarity and in a quest for a life of dignity and freedom. We share what we have and we struggle together for what we deserve, against the devaluation of our lives and dreams. 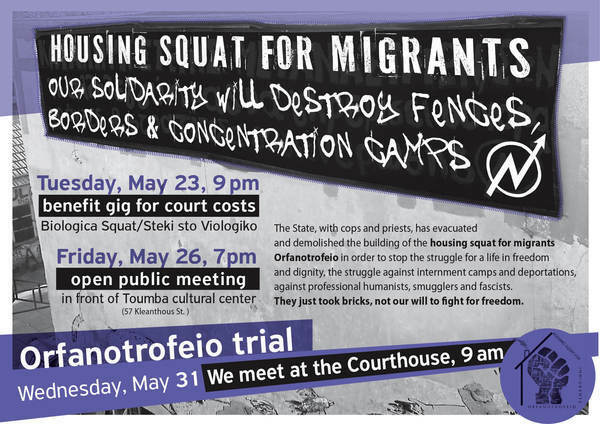 We might have lost one squat, but above all we confirmed that the State and its lackeys are seriously afraid of self-organization, practical solidarity to the sans papiers, and common struggles of locals and migrants.